Never thought I'd be on a poster... Click on the poster to be taken to the giant version on Flickr. 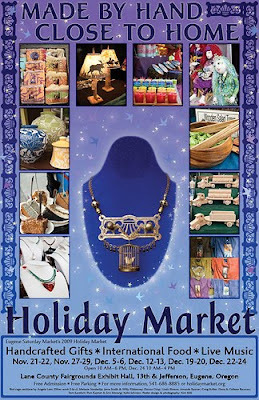 Holiday Market starts this Saturday, November 21! 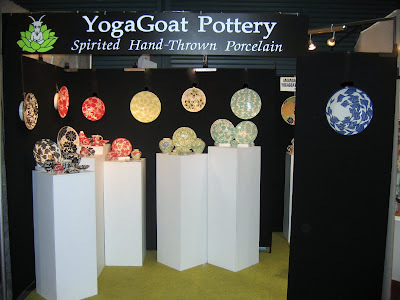 I'm in booth 164, all 14 days of the market. I can't believe it's here already. More info, directions, dates, and hours can be found here. I have to go make some quality merch now. I've been trying some new photos on my new computer and editing in picnik.com. It's a fun site; simple to use. I'm considering spending the $24.95 on the premium membership, but I haven't needed it yet. It is good to freshen up the shop. Even if it doesn't look better, at least it looks different! Oh, and speaking of freshening up. 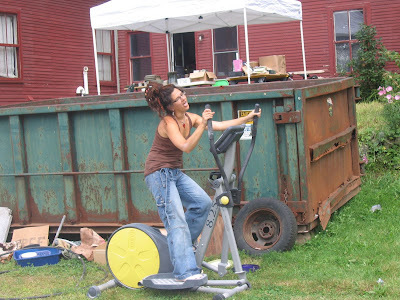 Here is a photo of the dumpster I filled with all the crap that was around my house! This is the worst blog ever. That's all. It just is. This blog needs some love! Oh, my. Has it really been that long? Well, no use beating myself up over my absence. I am like a deadbeat dad, except with a neglected blog instead of neglected children. Hey, I feel better already! And, to top it off, I'm not a crackhead either. Could I be any more awesome? 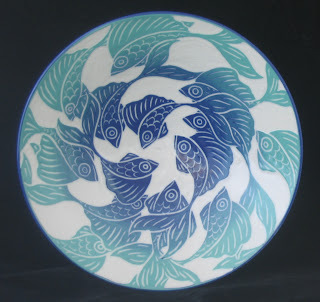 I am quite smitten with the blended colors of the fish and dahlia bowls. Both are listed in my Etsy shop. 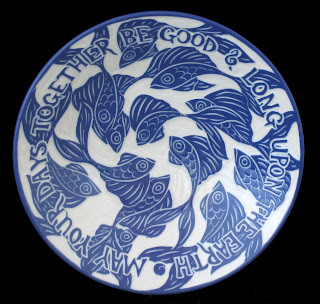 I spent a long time looking for the perfect phrase for a wedding bowl that could be kept in stock in my Etsy shop, and settled on "May your days together be good and long upon the earth." My friend John suggested "Live long, and prosper." 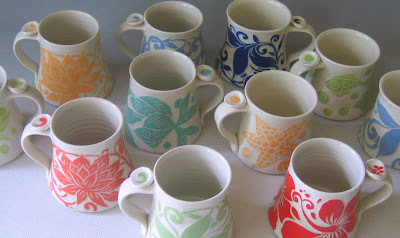 Made pots for orders from BMAC for the past three months. 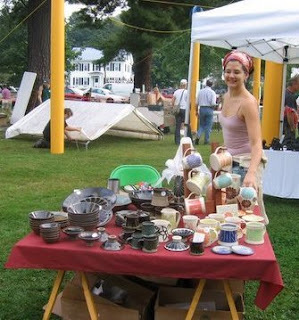 Literally, besides going to the Farmer's Market in Middlebury once a week, making pots was all I did. Making pots and trying not to give myself carpel tunnel syndrome. Baby Kenny (the only doll I still have from childhood, who I named after my dad) went on a sailing trip. At least someone got out of the house! 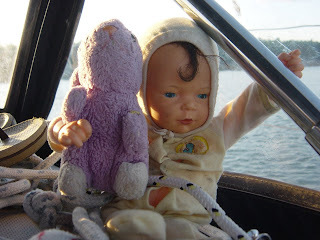 Baby Kenny went sailing with Vetch, the lavender rabbit thing, and friends John and Becky, off the coast of Maine. I was a good little potter and stayed home to make merch. When I last wrote, I was getting ready for Paradise City Philadelphia. When I got back from the show, I frantically began preparing to leave for ACRE. The preparation pretty much continued until the day I left for Las Vegas. The blog suffered from neglect. Lest it die from attrition, I am here to blog on. I promise not to say "I've come a long way, baby". However, I do think it is important for a person to recognize the progress that he or she has made. Often, we get lost in the present and the future, wondering what the next step is: what shows to apply to, what shows to do, what to make, what will sell, etc. We shouldn't live in the past, or spend too much time patting ourselves on the back, but let's take just a minute every now and then to appreciate our own hard work. My neighbors at Paradise were amazing, as my neighbors usually are. 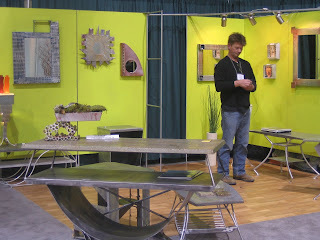 Here is a photo of Jeff Freeman in his booth: I had been in 2 shows before with Jeff, but never really got to talk to him about his work. I just spent the last 20 minutes engrossed in his website. Pay a visit if you've got a little time. One bit of information that I don't see anywhere on his site is the fact that all of the poured concrete slabs in his furniture have "fossils" in them. He'll slice apart old pipe fittings and ceramic fixtures, incorporate them into the concrete, and sand them down with the slab. (I'm probably murdering the process with my very limited perception of what he does, but you get the idea.) The results are subtle, but quite stunning. He showed me photos of a custom countertop he made for a client's kitchen. There are old knives and forks embedded in the countertop. 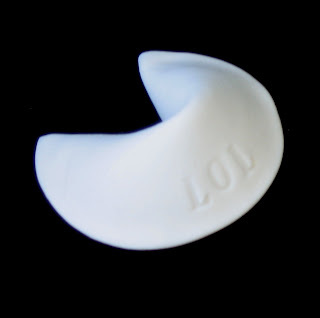 Apparently, guests are always trying to pick them up off the counter, which makes for some amusement after a dinner party. If I had a more modern abode, and unlimited funds, I would certainly be patronizing this guy. As it is, all I can offer him is a "That's really awesome! ", an "Oooh, I like that one! ", and the ever inspiring "Your new walls look fabulous!". Well, that's about 25% of what I wanted to blog about today, but I need to get back into the studio. Have a fabulous day, and thank you for taking the time to read this! I can't believe tomorrow is April already. It snowed this morning; so much for March going out like a lamb. The saying definitely does not apply in Vermont. Paradise City Philadelphia is this coming weekend. I'll be in booth 139, should you find yourself at the show. This is the most selective of their shows, so I was pretty thrilled to get in. My sister lives in Philly, so I have a free place to stay there. That is why I applied to the show; I'm cheap, er, I mean frugal. My booth will look something like this, though it will be a bit deeper, a full 10x10, and it will be a corner space. I love my propanels. 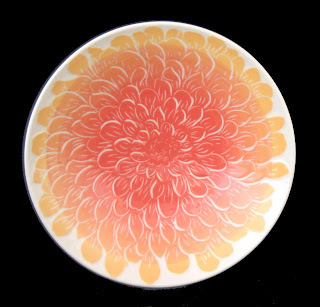 I bought them after I did a show across from painter Sean Huntington, incidentally a very talented and funny guy. He's from PA, but he won't be at this show. His booth looked great and mine looked blah. Rented pipe and drape is pretty lame; especially when the guy is setting it up for you and you're noticing all the stains. Um, do you have another panel on you? That one looks like it was used for a body dump. I'm looking forward to seeing Kenny Delio again; we met a couple of months ago at BMAC. Natalie Blake will be at this show too. Only problem with shows: not enough time to socialize and see all the great work. I had an idea a few shows back, that it would be great to have all the booths on moving platforms, sort of like those spinning restaurants you can go to and have a $20.00 cocktail. Yes, it would make mapping the show problematic, but at least the exhibitors wouldn't have to see the exact same booth for 3 days straight. Don't get me wrong- I'm always across the aisle from an amazing artist. But by the second day, I have their product line, booth set-up, and sales pitch memorized. On the plus side, I have had really good luck with my neighbors at these shows. At BMAC, I left my booth for a lady's break, and when I returned Adam Paulek was writing an order for me. Rock on, awesome neighbor! This impending show is why I have been up late crafting all weekend. I'm about to crack the kiln, so I can glaze everything and reload to do the glaze firing overnight. Here I go. Oh, one more thing. I made a potter's delight banner. It doesn't really go with my style, but I do crack myself up. Get it? It's embarrassing if I have to explain my lame jokes. 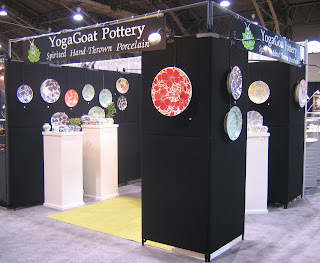 I am Amanda Ryznar, and my company (just me) is YogaGoat Pottery. I have been potting for almost 13 years, first at Slippery Rock University in PA, and then at 2 potteries in VT. Now I'm in Eugene! That is all.